In order to fully understand construction equipments, tools and plants, its better to have a better knowledge of how they're categorized. Now let's discuss these road construction equipment according to portability. When talking about portability of construction equipment, we're simply referring to how easy it is to move these equipments when being used. Now in this category, we have portable tools/equipment, we have fixed tools/equipment, we also have the mobile tools/equipments. Portable tools used in road constructions are those that can be moved about by pulling, pushing or carrying by hand. 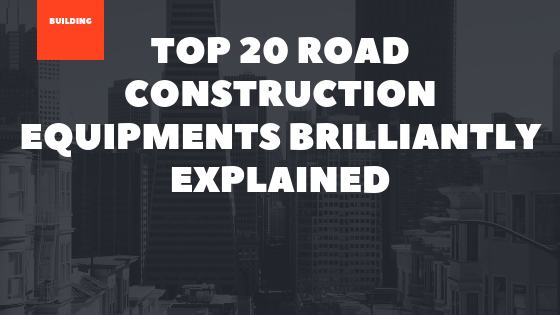 In talking about top 20 equipments used in road construction, we must mention the fixed tools. They're such tools or equipment that are operated from a fixed position on site. Examples of fixed tools/machines/equipment includes cranes, asphalt plant, crusher plants, etc. In Road Construction, we make use of mobile tools. They're generally tools and equipment that can be moved from one place to the other under their own power. Examples of Mobile tools include graders, tippet, bulldozer, etc.